Scottish Conservative leader Ruth Davidson has met former chancellor George Osborne at the offices of the London newspaper he now edits. Ms Davidson was featured on the front page of yesterday’s edition of the Evening Standard- which Mr Osborne has edited since he stood down as an MP in May. The Scottish leader has been seen as a key ally of the embattled Prime Minister, Theresa May, who has been fighting off challenges to her leadership after a widely-criticised speech to the Tory party conference. Her meeting and piece for Mr Osborne, a critic of Ms May, has been viewed as a step away from her support for the Prime Minister. 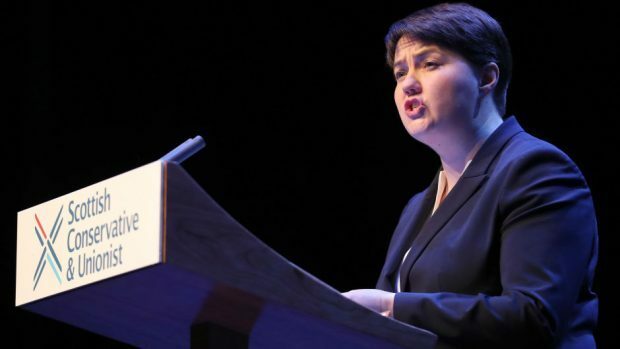 Her article advised the London Conservatives to learn lessons from her strategy in Scotland before the upcoming local elections. She wrote: “I can’t tell you how vital it was that I was able to write a separate Scottish manifesto at the recent general election. “The differences weren’t a rebuke to the offering for other parts of the UK, they were simply a demonstration that we’d put genuine thought into Scotland’s needs. “The party in Scotland failed for years, before it began to succeed, and it only did so when we embraced a devolved offer that set us apart from the centre. A source confirmed that the pair had met again after the article was published at the Evening Standard. The Scottish Conservative press office declined to comment on Ms Davidson’s movements.